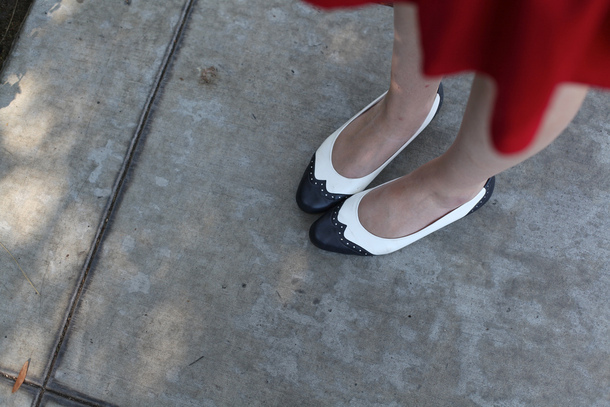 Chances are, you've seen this Modcloth dress floating around the Internet before now. I've seen it on Modcloth's website over the years whenever it comes back into stock, and I've seen it some of my favorite bloggers. Usually, this would lead me to not want a piece in an effort to be unique. However, for the first time possibly ever, I wanted that item that everyone else had. I think most people have a mental list of items they want to get their hands on. Over the years, mine has gone from very specific (those Dolce Vita booties that I never got my hands on) to more classic pieces (a striped shirt, a denim jacket, cream oxfords, etc.). This past summer, there was something about a red dress that just sounded appealing. I hunted for the perfect one, but none of them seemed quite was I looking for. Then, after receiving that Modcloth gift card for my birthday (along with some store credit I had been saving), I remembered that this gem existed. Not only did it have the vibrant shade of red and A-line skirt I had been hoping for, but the collar was unbeatable. This is one of those dresses that I know I'll wear to death and be able to style countless ways, so I wanted to keep it simple for this set of pictures. I already wore it differently when I went to lunch with two of my close friends last week and I'm convinced that the possibilities are endless. What pieces are on your list of must-haves at the moment? aww you look so cute, Elana! this has to be one of my favourite outfits of yours, that dress suits you so well! This dress is so very you Elana. I was actually surprised that you didn't have this dress before it is so you, but happy you are loving it! Elana, this dress looks so freakin good on you. I'm so glad you bought it! On my list is a brown leather backpack, a denim vest, and a logo-less baseball cap. Ahh this dress is perfect on you! I love the red, and you're right -- that collar is fantastic! I love how you've styled it, too. 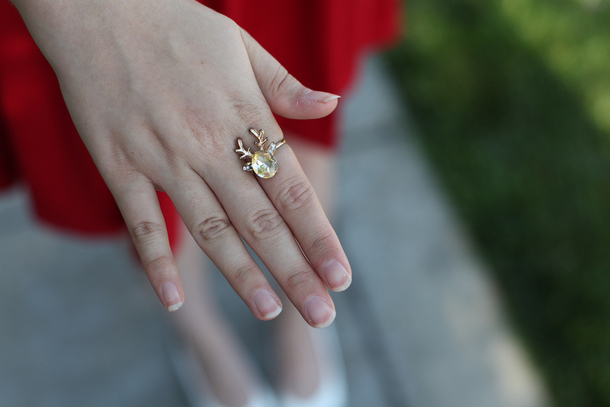 And that ring is too cute! I have so many things on my need-it list... one of the main things is actually just tops, because my closet is like, 75% dresses... eep. That dress is SO cute and looks amazing on you! I love the way you styled it here and can't wait to see how else you'll style it! By the way, thank you for always leaving such sweet comments on my blog. They totally make my day! You look absolutely adorable today, I love your red dress and I can see how many ways you could wear this! I'm so glad you got this dress because it looks wonderful on you! 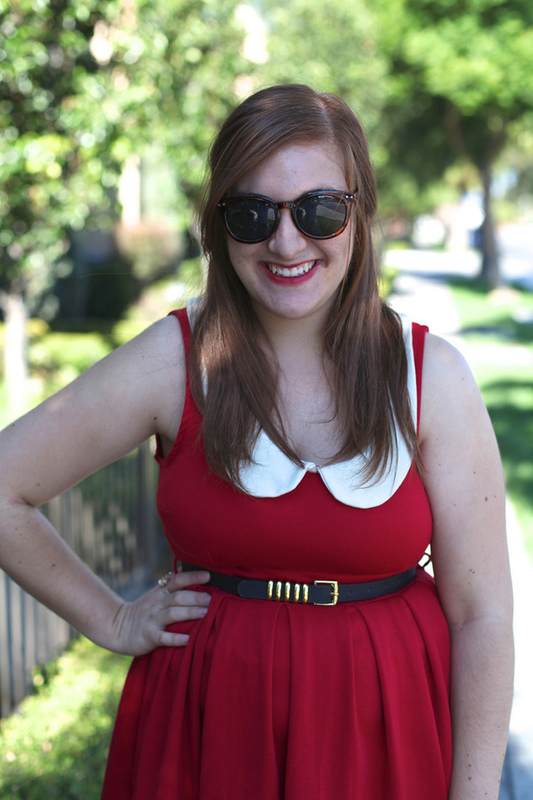 The fit and the color, and the peter pan collar is just too cute! Red looks beautiful on you! I was totally gonna ask about the phone, haha! Red looks great on you Elana! I'm sure it was a wise purchase. Lovely pictures too! Gah you look amazing in red and I LOVE this dress! Now I totally want it haha it's just....perfect! And I'm not one to usually like red so that's saying something! I actually like the phone pose too haha it's kind of adorable. :-D I feel the same way about this dress! I don't think there's anything wrong with wanting to wear a popular dress - it's obviously a goodie! It's not the right shape for me, though, but I love seeing it on everyone else and I think you're so right about how versatile it is. That dress is so freaking beautiful! You look great in it too, red looks so nice on you! You always have the cutest jewelry, I'm green with envy haha. so cute! agree with others, you look good in red!! That's so pretty! I love the Peter Pan collar with it. I do the same thing with my "mental shopping list". I just have a list of basic pieces in my head that I am always on the lookout for. My must-have is definitely a good flannel button up. I haven't been able to find any good ones that are cut for females, so I've been making do in the men's department. So glad you're happy with the dress! You are seriously the cutest thing! Love the peter pan collar on this dress! Sometimes things are really popular for a reason! This dress is SO cute and it looks adorable on you. Love the color, especially paired with those shoes. What an awesome, versatile piece for your wardrobe! Those shoes! Thrifted beauties! Love the entire outfit, I'm a sucker for a peter pan collar and you just look adorable! Thanks for stopping by my blog :) Glad to have found yours! You look wonderful in red, it's so empowering! Love how you styled this dress, the shoes are a wonderful compliment! This dress is one of my all-time favorite pieces in my closet too! It's just so cute and easy to throw on and look instantly presentable. I even wore it in an audition video that I posted on my blog yesterday. I really like the black belt you paired with your dress and those cute two-toned shoes. Oh my goodness, that dress is just so adorable! The color is so perfect on you and those sunglasses are amazing!